Vincent van Gogh lived more than 115 years ago, and yet his artwork is still altering the way mankind views beauty, persona, individuality, and style in art. His thousands of paintings and drawings have various characteristics that have been copied by thousands and duplicated by none. Van Gogh’s unique life has inspired millions to become active in art. In fact, what many people today consider to be the archetypical “artist persona” is largely a result of his influence. Perhaps the most impressive aspect is that artists continue to mimic the style that Van Gogh created over one hundred years ago. The impressionists and post impressionists of Vincent’s time influenced him greatly after he moved to Paris in 1886. The bright new palette reigned heavily over Gogh’s previous dark muted color scheme. Van Gogh’s use of this new impressionist and post impressionist style altered not only his work, but also all of art history. 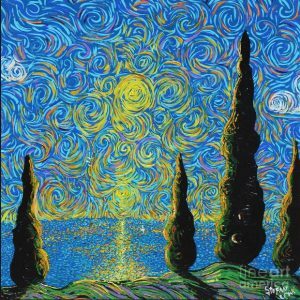 One particular artist is leading the contemporary impressionists in an effort to become “America’s Vincent van Gogh”… Stefan Duncan! Duncan’s amazing work is a plethora of brilliant colors tossed about in a whimsical style he calls Squigglism. Having been greatly influenced by Vincent van Gogh, Stefan utilizes this updated technique to draw the quick strokes of the impressionists into long curvy lines. These tight eddies of color dance around his paintings lighting every feature with beauty! It is this very beauty that Stefan strives to capture in all of his work; revealing the divine in nature! Stefan’s work continues to amaze us and it gives us great pleasure to be able to show it to the rest of the world. Each painting is Neo-Gogh while still presenting the signature style of Duncan. These paintings are a gift to all who love Vincent van Gogh and a perfect representation of greatness! I look forward to each new painting created by Duncan as his ability to present beauty continues to grow!